This summer’s 2012 Silverstone Classic powered by the AA will be one of just three official showpiece events celebrating the 50th anniversary of the MGB, widely hailed as one of Britain’s most cherished sportscars. The world’s biggest classic motor racing festival has teamed up with the MG Car Club and the MGB50 committee to establish a special trilogy of birthday parties to mark what’s a very special golden anniversary for the enduring and endearing MGB. The celebrations for the world famous ‘B’ open with MGLive! in June and conclude with a static showcase gathering at Blenheim Palace in September. In between comes this year’s all-action, three-day Silverstone Classic, staged at the home of the British Formula 1 Grand Prix from 20-22 July. All MGB owners attending these three special trilogy events will be presented with a unique commemorative rally plaque exclusive to the individual festivity. 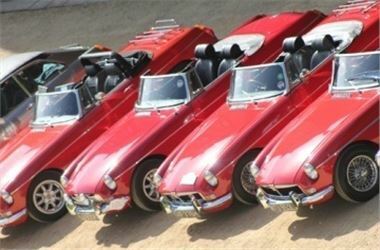 As well as featuring the very best of historic racing plus live music from classic rock bands, the Silverstone Classic is renowned for its huge car club displays often highlighting significant milestones in the history of iconic marques. Last year’s Classic marked the 50th anniversary of another truly great British sportscar when more than 1000 E-type Jaguars helped to establish a new Guinness World Record. Now the focus will switch to the much-loved MGB, first launched to the public at the Earls Court Motor Show in 1962. In total more than half a million MGBs were built between 1962 and 1980 in Abingdon – home of the illustrious MG factory situated just down the road from Silverstone to the south of Oxford. From the original Mark I roadster, through to the elegant MGB GT and the fearsome GT V8, the evergreen MGB has endeared itself as one of the most affordable and adored models whether as a first sportscar, desirable convertible, potent coupé or restoration project. The ‘B’ also enjoyed some notable racing and rallying successes during the Sixties with victories, either outright or in class, in a number of major endurance sportscar events (Brands Hatch, Nurburgring, Sebring, Targa Florio, Spa-Francorchamps) as well as the Monte Carlo Rally. With its rich mix of on-track competition and off-track entertainment, the Silverstone Classic will provide the perfect backdrop for the MGB50 with more than 800 historic race cars in race action and 7,000 classic cars on display across the weekend. Adding to the non-stop party atmosphere there will be flat out family fun for everyone with live music from Mike & The Mechanics and Adam Ant in the evenings plus a free fun fair, retail village, air displays, demos and the new AA World feature with its own wealth of attractions. So, whether coming for the day or taking advantage of the many camping options to enjoy the full three-day festival, MGB owners will have a truly memorable 50th birthday celebration. The Silverstone Classic powered by the AA is firmly established as the world’s biggest classic motor racing festival. The spectacular three-day event is staged at the famous Silverstone circuit, birthplace of the FIA Formula One World Championship and home of the 2012 Formula 1 Santander British Grand Prix. The festival features the very best of historic racing covering more than eight decades of motor sport as well as live music from classic rock bands and a wealth of family entertainment including free fun fair, retail outlets and air displays plus huge displays of classic cars. For more information: Visit the official event website www.SilverstoneClassic.com or either the MG Car Club ( www.mgcc.co.uk) or MGB50 ( www.mgb50.com) websites. Thanks for this calculator for mortgage rates. As for my personal experience, we need to plan for our financial capabilities to be able to address those mortgages like car loans.